Solar post cap lights are a great way to bring more light into your garden and not only do they raise your electricity bill, but they also look nice and warm up any outdoor area. There are plenty of models out there and you do need to think about how much light you actually need over night and how bright it should be as well. The solar post cap lights need to be weatherproof and waterproof, presenting a minimal risk for overheating. They should be able to take a rain or some wind, for more than just a summer. Check the size of the solar panels also and keep this in mind: the larger, the longer will last the light during the night. The batteries should also be able to hold their charge and handle the weather challenges. You want your solar post cap lights to fit your needs and the looks of your outdoors. After all, the right solar post cap lights may improve tremendously your fences, but they can ruin them just as well. 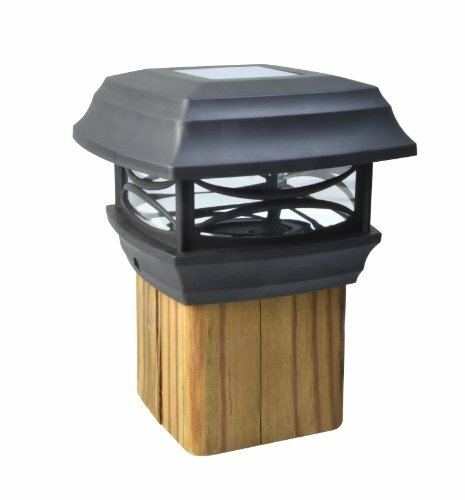 Go for the solar post cap lights that are easy to install also so you don’t have to make any alterations to the post caps. It wouldn’t hurt to check your pockets also. The more you’re willing to spend on the solar post cap lights, the more you should expect when it comes to durability, performance and…looks. 1). Complete the looks of your wooden posts with the Moonrays 91253 Solar-Powered Post Cap LED Light for 4×4 Wooden Posts. The post cap light fits 4×4 posts and uses solar panels that charges the battery so that the LED lights runs all night long. As long as the solar panel gets enough sunlight exposure during the day, the battery charges efficiently. Additionally, the battery holds its charge and the light runs up until the morning. The LED gives a 2.4 lumens output and it’s a nice, not too white, warm light. It’s easy to install the post cap light on any 4×4-fence posts as it comes with two mounting screws for wood. The construction isn’t bad at all and the plastic housing is tough, durable and takes difficult weather conditions. The plastic lens is clear and matches so well the black finish of the post cap light. The post cap light looks simple, yet pretty and classy. Able to take the winter temperatures, the post cap light sure looks nice and gives a warm light, which is enough for many. All in all, for a good price, you get a nice looking solar post cap light that gives a warm, nice light almost all night long. 2). Looking great at night but during the day as well, the Moonrays 91241 Stained Glass Solar Post Cap Lamp is an elegant light to try for your outdoors. 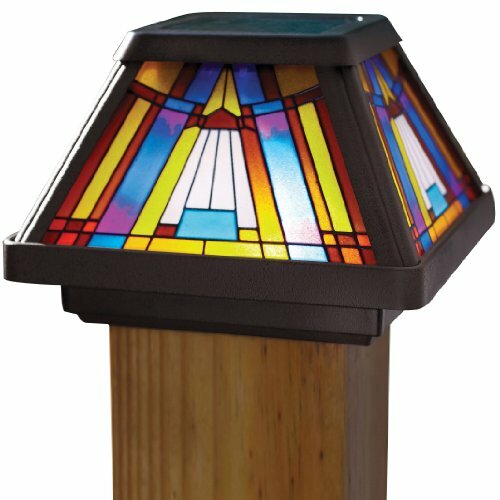 The solar post cap light presents a traditional stained glass art style that stands out from many with the abstract, yet colorful look. The post cap includes a 7 lumens LED that gives a warm white light they is bright at night. The solar panel charges during the day and gives power to the build-in AA NiCd battery. The battery turns on the LED bulb at night, so you don’t need to turn it on. The white LED has a 120-degree, wide angle beam that covers a good area. You may easily install the post cap light to any standard 4×4 wooden posts as the post cap is 3.5”x3.5”. It comes with the wood screws you need for installation. You may also wall-mount it as it includes the optional wall bracket as well. The build of the light is good, including plastic, metal frame and 4 hand painted glass lens. The glass lens looks nice and the bronze finish add a classic style to the post cap light. The classic appearance, good light and reliable build recommend the post cap light when in need. 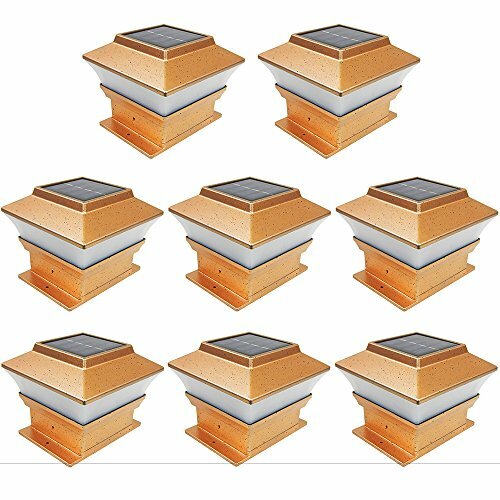 All in all, for a good price, you get an elegantly looking solar post cap light that bring light at night and classy feel in the daylight. 3). If you want bright light on your fences, put your trust and faith in the Westinghouse Hilltop 20 Lumens Solar Fence Post Cap Lights. The solar post cap lights give a 20 lumens output for even 6 hours at night. They dim up to 5 lumens after 6 hours, though. You don’t have to worry about operating the lights as they automatically turn off and on once the night is coming. The internal sensor is sensitive and reliable. You may easily mount the lights to standard 4×4 wood posts and the pack includes 2 post cap lights. The included base adapter is helpful for rails mounting. The 18500 Li-Io battery is efficient and keeps its charge. It’s durable and takes the intense use. The lights present a good build that take all weather conditions, even though it includes plastic. The looks aren’t bad either and the post cap lights look nice night and day. Bright and easy to install, the lights are a great choice when you want bright light at night. Whenever in need for some nice looking bright lights for post caps, don’t hesitate to give these ones a try. 4). 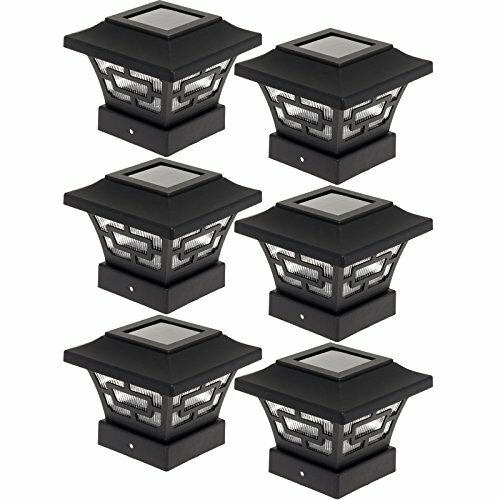 When you only want to go shopping once, put your money at stake with the iGlow 8 Pack Copper Outdoor Garden 4 x 4 Solar LED Post Deck Cap Square Fence Lights. The lights come with build-in rechargeable AA batteries that may take 2 years of use until it needs changing. It’s very easy to use the lights as they include automatic sensor that activates at dusk. They are also easy to install as there’s no wiring and you do get the fence post attachments and parts you need. The solar panel is reliable and charges well all day long. The battery holds its charge and the lights run all night long. The build of the lights is good and they are weatherproof. The cap post lights are protected against the elements, taking a splash or a light wind. They are made of plastic and are lightweight, whereas the finish looks good on any porch/fence. The solar post cap lights give a nice, not too bright light. They fit nicely, but you shouldn’t mount them on plastic, vinyl or PVC posts. Looking sharp and giving a nice light, the post cap lights deliver good performance. Despite the minor downsides, we still like the solar post cap lights for their looks and reliable performance. 5). 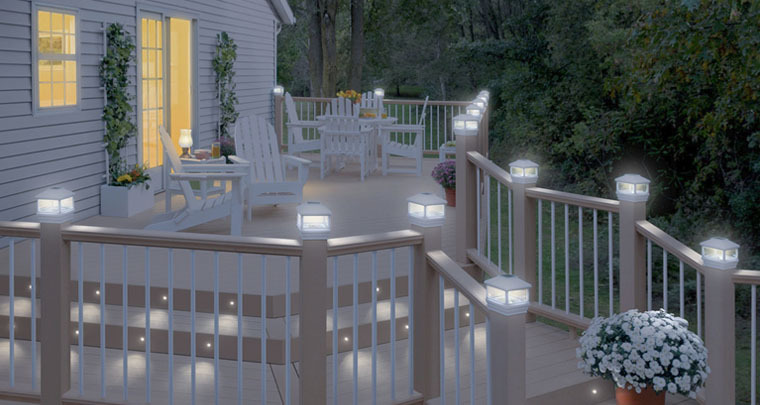 Dressing up any deck so nicely, the Paradise GL28998BZ Solar Cast Aluminum LED Post Cap Lights bring many good things to the table. The lights fit any standard 4”x4” wood post and each post cap light comes with the matching mount for flat surface or fence. The list of good features continues with the crystalline panel that is more efficient than typical amorphous solar panels. This means it charges faster and its energy lasts longer. The build-in Ni-MH rechargeable battery holds its charge and the light runs all night long. The light sensor is good so the lights turn on automatically at dusk and turn off the same way in the morning, due to the photocell technology. The build of the lights adds up on the list and the post cap lights feature protective hammered glass lens and long lasting aluminum body. The bronze finish cast isn’t just durable, but also looks so nice. The aluminum body doesn’t rust, extending the lifespan of the post cap lights. The lights fit nicely and the light is warm, soothing and not too bright. They are built to last and look nice on any deck. Durable, looking nice and giving a warm light, the solar post cap lights sure make it as a good buy anytime.